Nelson Mandela said “Education is the most powerful weapon which you can use to change the world.” Please, before you decide to post things on Facebook, educate yourself to see if the information is actually true. I have read multiple posts about privacy concerns with Facebook and Facebook messenger. Most of these concerns are the result of a misinformed public, parroting what they read in their newsfeed. Snopes.com is a great resource to help you determine if the information is actually true or not. Please help keep Facebook free from misinformation. Please don’t just blindly repost something because your friends are doing it. If you are really concerned with your privacy, please delete your account, but be aware that everything that you have posted, up to this point, can and will be used against you in a court of law. As I sit here at my brother and sister in laws house, enjoying the fire, I pause to reflect on the blessings that The Lord has blessed me with. 1. Salvation through Jesus Christ. I am so undeserving of His Love and favor. 2. A loving family. God has blessed me with a loving wife and daughter. He has also given me a great extended family. 3. A great job where I can make a difference in the lives of other people. 4. Great co-workers who know how to balance ministry with having fun. 5. A great church family. Where you start will shape your world view. I have been privileged, this week, to attend the Answers for Pastors conference in Petersburg, KY. The conference was held at the Creation Museum, a ministry of Answers in Genesis, whose primary goal is to evangelize and to educate people on the historical account of Creation and the early history of our world. The emphasis of the week has been learning how to reach our culture with the Gospel of Jesus Christ. In the past it has been easier for people to understand concepts such as God, sin and the fall, because Christianity ,or an understanding of Christians concepts, was taught or at best tolerated in our culture. But today, we live in a culture where these concepts are not embraced, where in fact, they are banned and even mocked. We have a whole generation of people who have grown up outside of the church and inside an educational system that states that we are mere products of time, chance and death. Because our culture does not have a proper view of where we came from, it cannot have a proper view of concepts like, sin, death, redemption or even of God. As a pastor, it is my responsibility to point people to Jesus and to make disciples. Sounds easy, but it is not. In order to do this, God needs to do a work in the heart, after all, only the Holy Spirit can draw a person to Jesus. But from a human standpoint, a person needs to understand that he is a sinner in need of a Savior. This is a tough task if mankind just evolved over millions of years. If man came to be as a result of evolutionary processes, then there was no literal Adam. If there was no Adam, then there was no Eve. If these two people did not live, then they could not have sinned and disobeyed God. If they did not sin, then there would be no need of a Savior. Very quickly we see the problem that is facing the church today. It is a matter of starting points. This is why it it so important to teach the Bible and the redemption narrative starting in Genesis. This is the way that Paul taught the Greeks. In Act 17, we see that Paul declared to the Athenians the “unknown God”. Paul, in order to help the people understand, took them back to the Creator God. I suggest that that is where we need to start our Gospel presentations today. Why? Because today, when we say God, people wonder what god you are talking about. We need to bring people back to Genesis, to the very beginning of the redemption story, so that they understand why Jesus came to earth and why He died for humanity. God created this world and all things. He created Adam so that He could have a relationship with him. He also created Eve out of Adam’s rib. He blessed the pair and told them to be fruitful and multiply. He also gave them one prohibition- don’t eat from the tree of the knowledge of Good and evil. When mankind listened to the serpent instead of God, they died spiritually and all of creation began to die too. But God in His mercy, promised a savior would come to redeem the creation and mankind. Now, about 6000 years later, we have forgotten our Creator God. We have turned to the gods of chance, time and natural processes to explain our origins and our purpose. No wonder we are so messed up! We no longer have the same starting point and therefore will not be able to arrive at the same conclusions. I just returned from a quick three day vacation in Wisconsin. 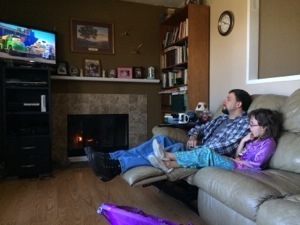 My wife Heather, my daughter Daisy, and I, made the seven hour trip to Pembine, with no problems. We travelled through rain for about a third of the trip, but that soon gave way to clear skies. I always enjoy going to this part of Wisconsin. For one thing, my parents live there. For another, the scenery is breathe taking. My dad shared with me that a recent air quality report stated that the purest area in the the United States is about 3 miles from where my parents live. On Friday, I went for a 9.5 mile run. I was a bit concerned because of all of the hills, but I soon discovered that I was able to run with no problems. The air was so clean and crisp. The sky was so blue. The scenery was beautiful and the temps were great (the high 40’s). Getting away was great, because it allowed me to get out of the every day routine and unplug for awhile. Jesus saw the need to unplug and get alone with God, and we would do well to do the same. There is something great about getting away. Perhaps these are among the hardest words to say in the English language. They are right up there with “please forgive me” and “I am sorry”. These words, and the feelings and actions behind them, make us vulnerable. They reveal that we don’t always have it all together. They show us that we are human and make mistakes. As followers of Christ, we are called to be salt and light. We are called to do the difficult thing and ask for forgiveness when it is necessary. James 5:16 says Therefore, confess your sins to one another and pray for one another, that you may be healed. The prayer of a righteous person has great power as it is working. This verse teaches me that I need to keep short accounts with people. When I offend, or wrong, or sin against someone, I have a responsibility to confess and ask for forgiveness. When I do that, I begin to receive the healing power of the Holy Spirit, and the relationship can begin to be healed. I recently had to apologize and ask for forgiveness from someone that I didn’t even know. I was acting on old information and asked this person to do something. Turns out, that my intel was wrong and I looked like a fool because of my request. When it came to my attention, that my information was outdated, I called the individual and asked for their forgiveness. They graciously gave it. You know, I didn’t want to make that call, but I am glad that I did. It gave me the opportunity to live out my faith and ask for the thing that I need most, forgiveness. Is there someone that you need to go to and ask for forgiveness? What is standing in your way? It may not be easy, but it will be worth it. 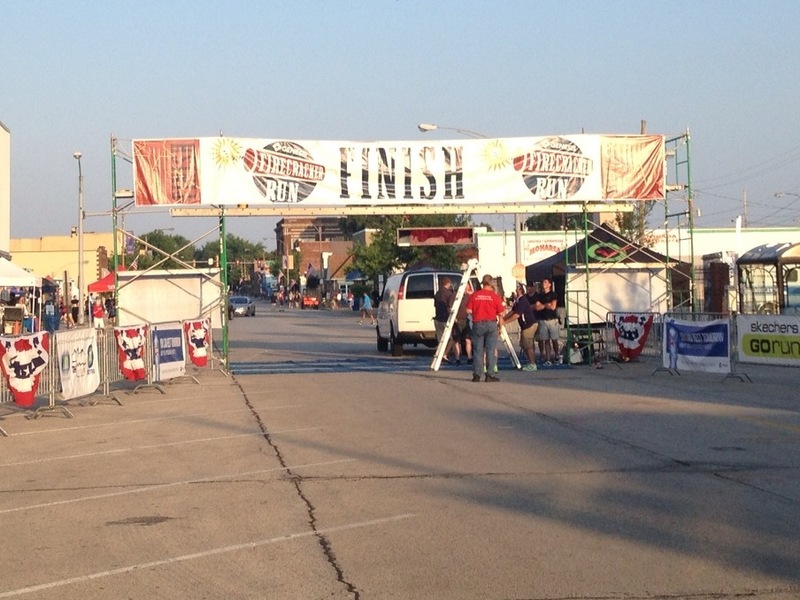 Recently, I had the opportunity to compete in the Firecracker 10K race on July 4th. Race time conditions were ideal with temps in the 60’s. The course was a bit hilly and challenging. Along the way, there were bands, singers and even crazy guys dressed up as Elvis. At pre-determined intervals there were water stations, where you could refresh yourself before continuing on your way. Toward the end of the race (mile 5), there was a decent hill for all of the runners to scale, followed by a nice long downhill decent. But the race was not over. You still have another mile to go! This year I have also been able to run a 5K and a half marathon and in 3 weeks, I will be running the Bix, a grueling 7 mile, hilly race. It doesn’t matter what race a person decides to run, all runners are interested in one thing, crossing the finish line. I am a slow runner compared to those who won this race. Did it discourage me from running? No. I was out there to do my very best and beat my best time at 10K distance, and I accomplished that goal. In life, we have two choices, we can run the race that God lays out before us, or we can run our own race and follow our path. The path that God lays out before us will be challenging. It will have hills and valleys. Good times and bad. Times of thirst and times of refreshment, but in the end, He is there to welcome us. As I was approaching the end of the race, I kept focusing on the finish line. I wasn’t concerned about the people around me or the people trying to run me down from behind. I wasn’t concerned about the last 6 miles of the race. My eyes were on the finish line. No matter what you are going through right now, may I encourage you to fix your eyes on Jesus? He doesn’t promise an easy “race”, but He does promise a great after-race party! Keep your eyes on Jesus! If you do not yet have a relationship with Jesus Christ, and would like to learn more about it, please let me know.